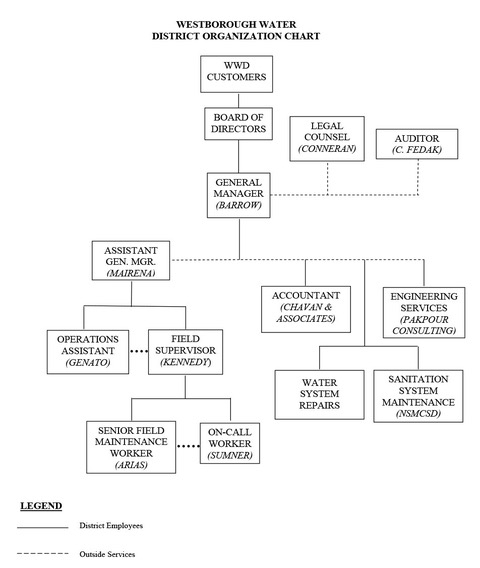 The Westborough Water District (WWD) presently employs five full-time employees and one part-time on-call worker. There are two office/administrative positions, three field positions, and the General Manager. Here at the WWD, we are very proud to provide our customers with the most efficient service in the most cost-effective manner. Our staff is always willing and happy to serve you! *We now have a deaf-friendly staff member who can assist our customers who might need this service. Please contact Jennifer Genato for more assistance.